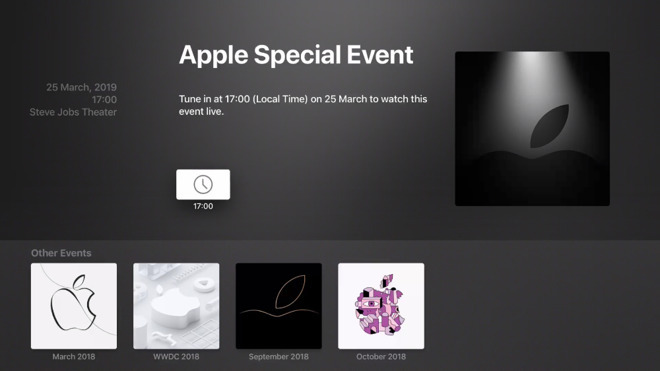 Apple has updated its special Events app on Apple TV to version 2.30 with a new redesign that reflects the company's invitation to its March 25 launch. The app's icon has been changed to show the top of a darkened Apple logo lit from above by a movie-like spotlight. The design fits with what is now expected to be an event concentrating on Apple's forthcoming video streaming service. An updated Apple News subscription package is also anticipated but with this design and the "Show Time" invitation text, it's believed that video will be the center of the event. That forthcoming service is known to have at least 11 shows that have already completed principle photography or are entering their post-production stage. 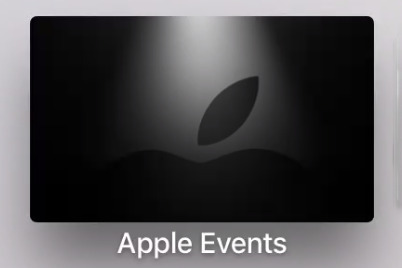 Consequently, the Apple TV Events app's icon has the same image as on Apple's special events page on its website, though with a slightly more pronounced spotlight effect. Launching the app brings a screen with the same logo image in a square set against a dark background and a very few details in text. There's the location, date and time —local to your region —to one side and an invocation to call in to watch at that time. As with previous versions of the Events app, there are also links to watch the previous four launches. This now means the 2018 events for March, September and October plus June's WWDC.